As you work in the Drawing or Camera view, some layers may be in the way or are used as references. You can hide these layers to make your work area less cluttered and easier to navigate. You can show and hide layers in the Timeline view in several different ways. • If you have anything selected, it is not affected. • When multiple layers are selected and you enable/disable the Solo mode on any of those layers, it is applied to all the selected layers. • When multiple layers are selected and you enable/disable the Solo mode on layers that are not part of the selection, it is applied only to those particular layers. 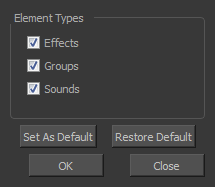 ‣ Enable/Disable All button to show or hide all layers. ‣ Solo Mode button to view disable your current Solo mode selection. Any soloed drawing or sound layers are disabled, so you can view all layers. When you click again on the Solo Mode button, you last Solo selection is displayed. ‣ In the Layer toolbar, click the Solo Mode button. ‣ Click the layer's Enable/Disable All button to show or hide that layer. ‣ Press A to show a layer or D to hide selected layers. ‣ In the Timeline toolbar, click the Enable/Disable button (you may have to customize the toolbar to display it). ‣ Hold down Alt and click the Solo Mode button of the layer you want to solo and hide all other layers. ‣ In the Timeline toolbar, click the Disable All Others button (you may have to customize the toolbar to display it).